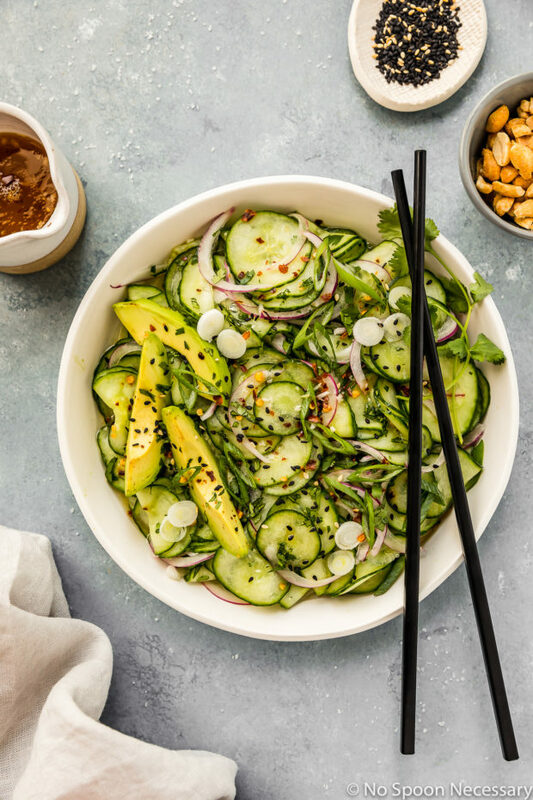 This refreshing Easy Asian Cucumber Salad recipe is perfect for summer! Crisp coins of cucumber with thin slices of pungent red onions and fresh herbs tossed in a silky, tangy umami packed sauce. 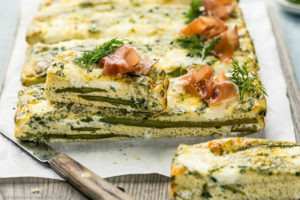 It’s a healthy and delicious versatile side that is guaranteed to be a hit! This post was originally published in March 2015. I took new photos, tweaked the recipe and changed some of the written post below to include more information about the recipe. You know what? This in between winter and spring time seriously stinks. Why did Punxsutawney Phil have to see his damn shadow? I seriously can’t stand this whole hurry up and wait for spring produce limbo. Mostly because I keep going to the grocery store, daily, to find diddly squat. And, the produce I do happen to find is all sad looking and picked over. It makes my heart hurt. Plus, patience has never been one of my virtues. While I do love a simple green salad, with a little cheese, tomatoes, cucumber and red onions, it just wasn’t exciting me. I wanted something Asian, but I wanted the cucumber too. And then I had a light bulb moment and I decided to make this fresh, fabulous salad. And, you guys, this salad hit the all the right notes and tasted SO good, I decided it simply MUST be shared. This simple Asian, or more specifically Japanese cucumber salad is similar to Sunomono, just jazzed up with a No Spoon touch. Delicate, crisp coins of cucumbers, thin slices of pungent red onions and fresh herbs tossed in a silky, tangy, slightly spicy and sweet umami packed vinegar sauce. Garnished with creamy avocado, nutty sesame seeds and salty peanuts, this salad is terrifically tasty. It’s fresh and light, with a depth of refreshingly cool, crisp and clean flavors. 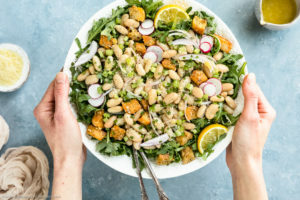 While this salad is great as a side dish, you can also add in chopped rotisserie chicken or canned tuna and eat it as a light meal. Or, it’s terrific over sticky white rice or seaweed salad. 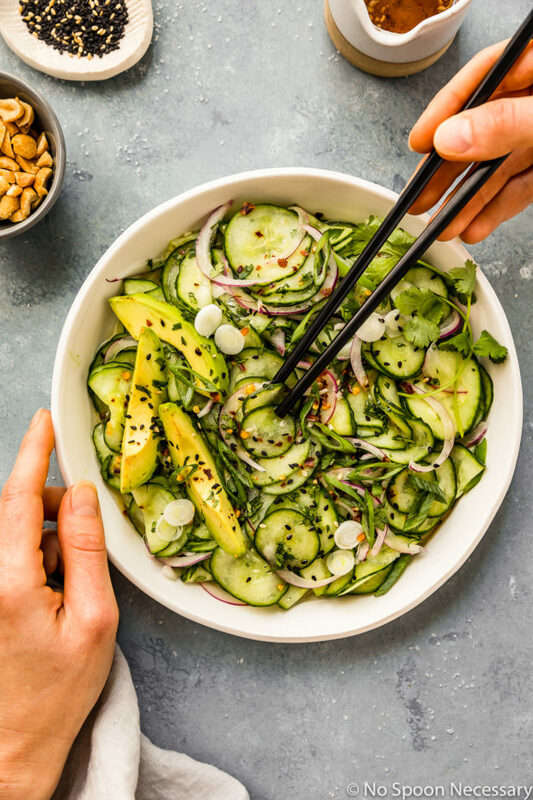 The simplicity of flavors, and ease of preparation, is what makes this Japanese cucumber salad recipe not only delicious, but also super appealing! What is sunomono? What is a Japanese cucumber salad? 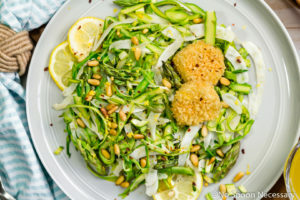 Since I said this Asian cucumber salad is similar to sunomono, I feel like it’s probably appropriate that I fill you in on what exactly a sunomono salad is so you can connect the dots. Sunomono is simply a Japanese cucumber salad. While there are many different variations, the base of the salad “dressing” is rice vinegar, soy sauce and ginger. 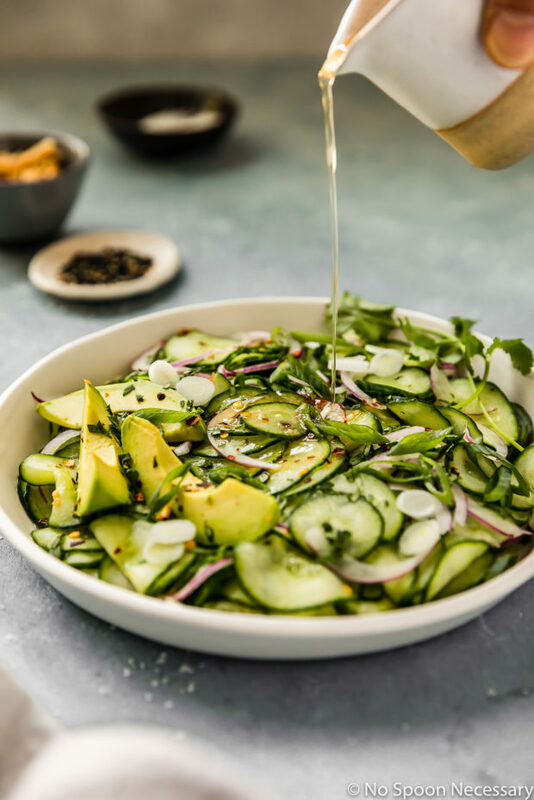 The recipe for the cucumber salad listed below includes rice vinegar and ginger, but swaps the soy sauce for aromatic sesame oil, plus there are a few add-ins which make this Japanese salad full of fresh, bold flavor! What kind of vinegar in an Asian cucumber salad? Rice wine vinegar is always used in Asian, or Japanese cucumber salads. Rice wine vinegar, also referred to as just rice vinegar, is made by fermenting the sugars in rice into an alcohol (such as wine), and then further fermenting the wine into acid. Rice vinegar has a slightly sweet, delicate flavor and is less acidic than white distilled vinegar. What goes with Asian cucumber salad? What to serve with Japanese cucumber salad? 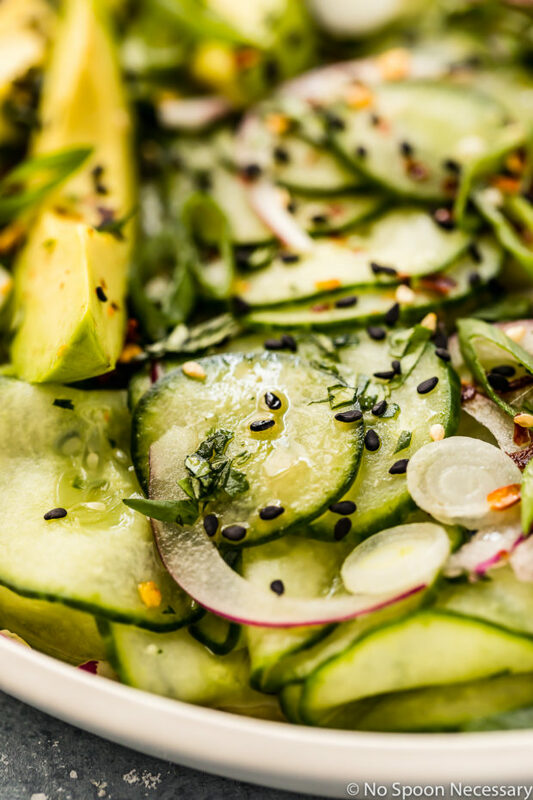 You can serve this sunomono style cucumber salad with pretty much anything your heart desires. 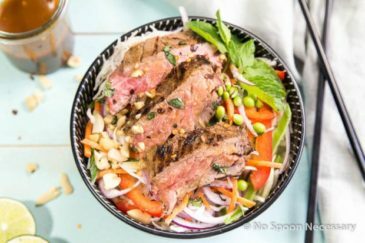 It pairs excellently as a side dish with anything from plain grilled chicken or teriyaki chicken to seared tuna or steak! Make sure you use seedless (or semi-seedless) cucumbers in this recipe. I used English cucumbers because that is what was freshest and readily available at my market. However, if you can get your hands on seedless, Japanese cucumbers, that would be my first choice! As well, Persian cucumbers will work here too. If you use English cucumbers like I did here, there is no need to scoop out or remove the seeds. Slice the cucumbers as thin as possible! Obviously this is made VERY easy if you have access to a mandoline, but if you don’t, just take a little extra care to slice the cucumbers as consistently thin as you can get them. Make sure you salt the sliced cucumbers to draw out as much excess liquid as possible!! The sweet, tangy dressing is a major component of this easy Asian cucumber salad. If you don’t take the extra (hands off) time to salt the cucumbers and allow them to drain, you will be watering down the dressing, which is a crying shame!! It’s ridiculously easy to apply a little salt to the cucumbers, toss them and place them in a fine-mesh sieve to drain, so do NOT skip this step! 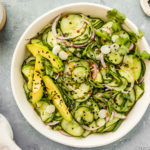 Until then, join me in celebrating this in between time of year, instead of dreading it, with this Asian cucumber salad. Cheers! 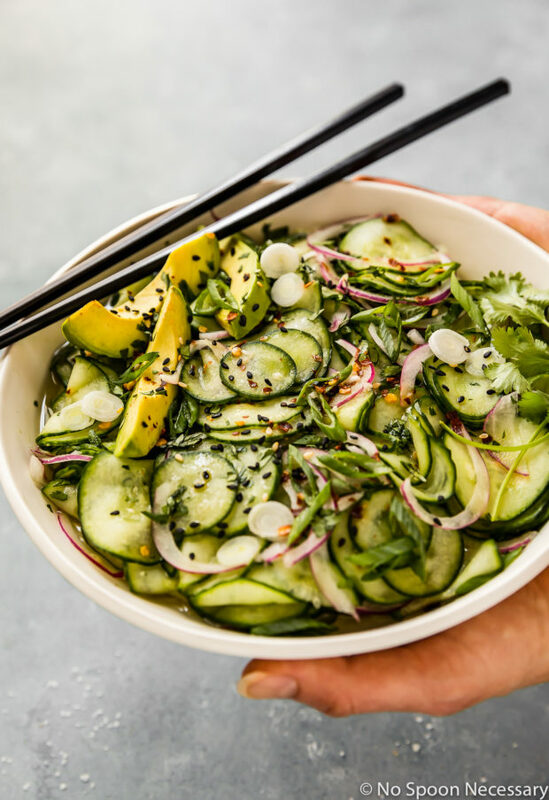 This easy, refreshing, crisp Asian Cucumber Salad is perfect for summer! Place sliced cucumbers into a fine-mesh strainer suspended inside a medium sized bowl. 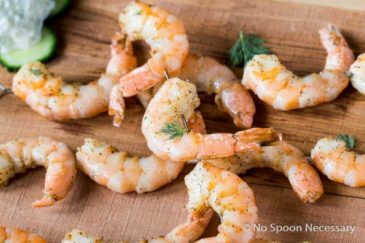 Season with 1 teaspoon sea salt. Toss thoroughly to combine. Place in the refrigerator for at least 30 minutes up to overnight to drain the cucumbers of excess moisture. Meanwhile, make the sauce: In a small bowl, combine the rice vinegar through the sugar. Whisk well and set aside. When cucumbers have been drained of excess moisture, remove from fridge and transfer to a clean kitchen towel. Pat dry. Add the cucumbers, red onions, scallions and cilantro to a medium sized bowl. Add half of the sauce and toss to coat. 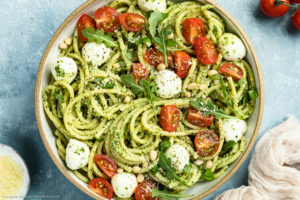 For best results (optional), place the salad in the refrigerator and allow the flavors to develop, for 30 minutes up to 1 hour, stirring occasionally. When ready to serve, taste and add more of the sauce as desired. Garnish with sesame seeds, peanuts and avocado if using. Enjoy! *Nutritional information does not include optional sesame seeds, peanuts or avocado. Slice the cucumbers as thin as possible! Obviously this is made VERY easy if you have access to a mandoline, but if you don't, just take a little extra care to slice the cucumbers as consistently thin as you can get them. Make sure you salt the sliced cucumbers to draw out as much excess liquid as possible!! 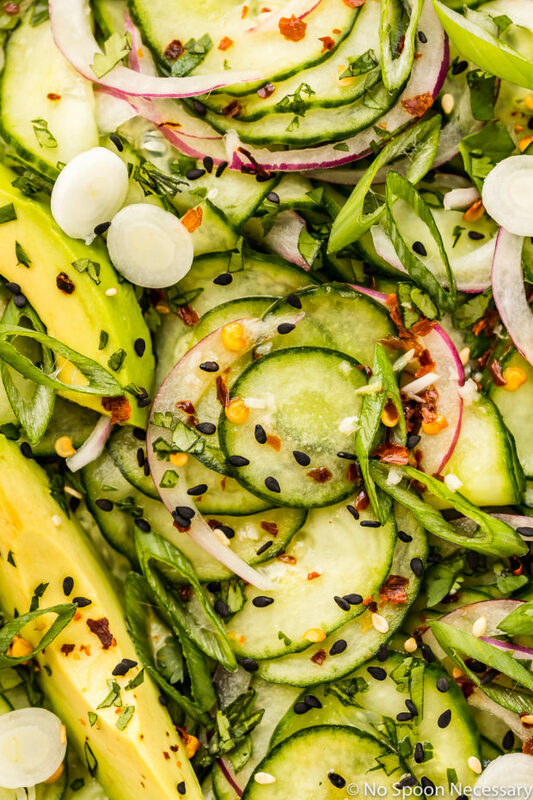 The sweet, tangy dressing is a major component of this easy Asian cucumber salad. If you don't take the extra (hands off) time to salt the cucumbers and allow them to drain, you will be watering down the dressing, which is a crying shame!! It's ridiculously easy to apply a little salt to the cucumbers, toss them and place them in a fine-mesh sieve to drain, so do NOT skip this step! I am so glad you republished this one, Cheyanne! I hadn’t heard of Sunomono before – what a delicious take on it this is! 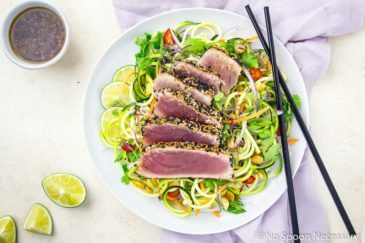 You have done such a fantastic job with those cucumber slices – your photography has me drooling over here in anticipation of having this for lunch – and I haven;t even had breakfast yet! Happy Wednesday, my friend – hoping this week has been going well for you!! Happy Wednesday, my friend – hoping this week has been going well for you! I bet the combo of the crispy cucumber and tangy dressing is just amazing! I can totally see me adding some chicken to it for a main meal! I love fresh salads like this for the summer. Not too heavy and perfect for a hot day! 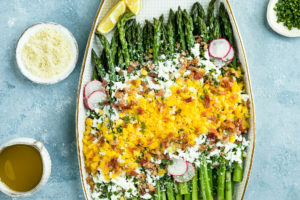 I love this style of zesty fresh salad, especially alongside big flavored meals on the grill. The perfect pair for the long weekend! 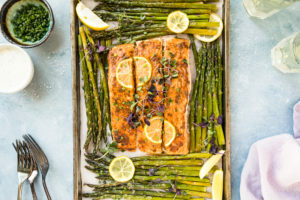 I love that you’re re-posting your old recipes because I missed so much! 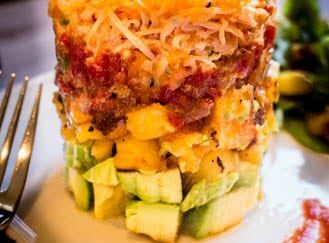 We were just talking about what to make for Memorial Day and I think I’ll have to add this to the menu. It looks SO GOOD! And so refreshing! Have a great weekend, Chey! Great recipe. I’ve been looking for a good recipe since I have tons of Asian cucumbers that I grew from seeds this year that I picked up at the local Asian store. Thank you so much, Anita! I checked out the photos of your cucumbers- WOW!!! Those ARE some ginormous cucumbers! ONE of those would make plenty of salad! 😉 Hope you have a fantastic day! Thank you for stopping by and leaving the kind comment! Cheers! Yum. I love this! My husband hates cucumber so I rarely ever make it at home, but this salad looks so beautiful. Tina, Thanks so much! I can’t believe your husband doesn’t like cucumbers?! Well, more for you and me… right! 🙂 Cheers, girlie!! The wait for summer seems to be excruciatingly long especially when there are a few teasing days that feel like summer’ish. Awesome looking cucumber salad and looking forward to trying it out when the weather is warm and fluffy. Cheers! Trevor, I feel bad complaining about waiting for winter to be fully over since I reside in FL. As far as the weather, I can’t really B* and moan… but as far as the produce, this wait is torture! I posted a short rib lettuce wrap today that utilizes these cucumbers. The slow cooked short ribs with the cucumbers is a perfect way to mix both winter and spring into a dish. Oh, and you better BET I will be rocking out a bunch of your burger recipes on the grill this summer!! Yay!! Cheers!! Mom, I did not know that… Grams is a great cook. I will have to ask her for her cucumber salad recipe! The asian spin I put on this salad is really delish. And I know its completely different from anything GG would have made. Love you!